121 Financial focuses on member referrals and centers of influence to drive new business. The credit union does more business lending than a typical credit union its size, and the loans often serve as catalysts for neighborhood economic progress. Member business lending at 121 Financial Credit Union ($564.8M, Jacksonville, FL) has grown sharply in the past decade. How? By keeping close to home. Focusing on influencers and partnerships, 121 Financial has built an MBL business of 2,400 members and $83 million, nearly twice the average for credit unions its size nationwide. Some of those business members have been working with Marovich and his team for a decade or so. Others come the credit union’s way through referrals. Law offices and accountants, for example, often refer one another to 121 Financial. That’s an example of a “center of influence,” Marovich says. Others arrive via the U.S. Small Business Administration, which recently recognized the credit union as its top North Florida mortgage lender for the fourth year in a row. Then there’s the Small Business Development Center at the University of North Florida and SBA-certified development corporations around the area that refer business to the credit union. There’s even banks, which refer borrowers seeking business loans too small for the banks to touch, Marovich says. With such word-of-mouth momentum, the credit union doesn’t pay for advertisements, although it does display placards about business loans and services at teller windows — another “center of influence” where members engage with their credit union. 121 Financial’s total MBL portfolio was $82.8 million at the end of the first quarter. It has steadily grown for the past 10 years and now far exceeds the $42.7 million average for credit unions with $500 million to $1 billion assets, according to data from Callahan & Associates. 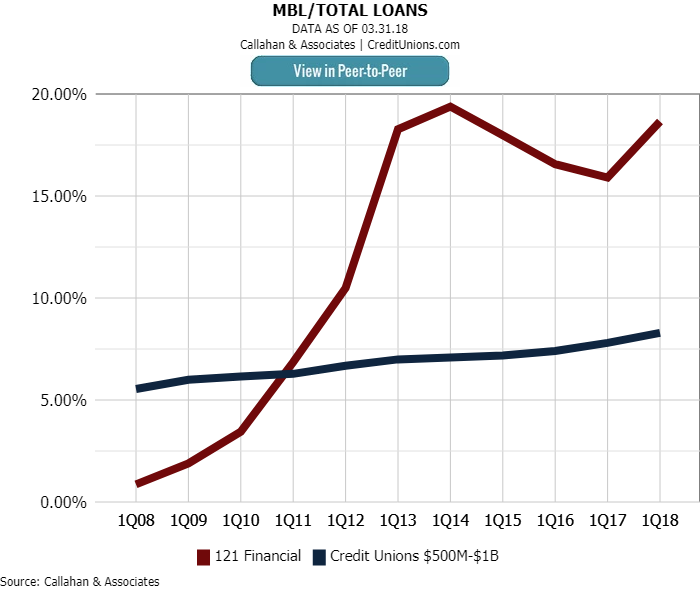 MBL loans comprised 18.7% of 121 Financial’s loan portfolio in the first quarter of 2018, more than twice the average of 8.3% for its asset-based peer group. 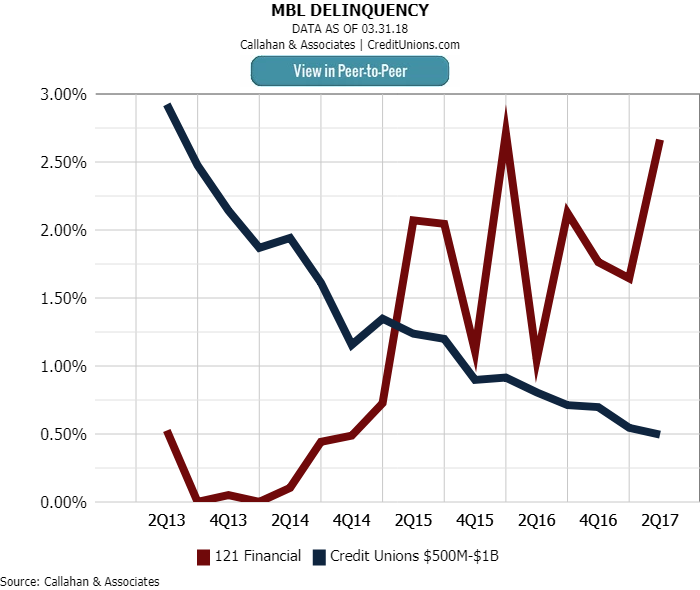 Two troubled loans have contributed to an MBL delinquency rate at 121 Financial that is well above the peer average. Credit union leaders expect the rate to drop to the average as soon as one of the businesses becomes current and the other sells its property. 121 Financial’s focus on serving small, community-based businesses is apparent in its average member commercial balance, which is $129,759. Compare this to $331,389 for all Sunshine State credit unions and $243,082 for asset-based peers nationwide. 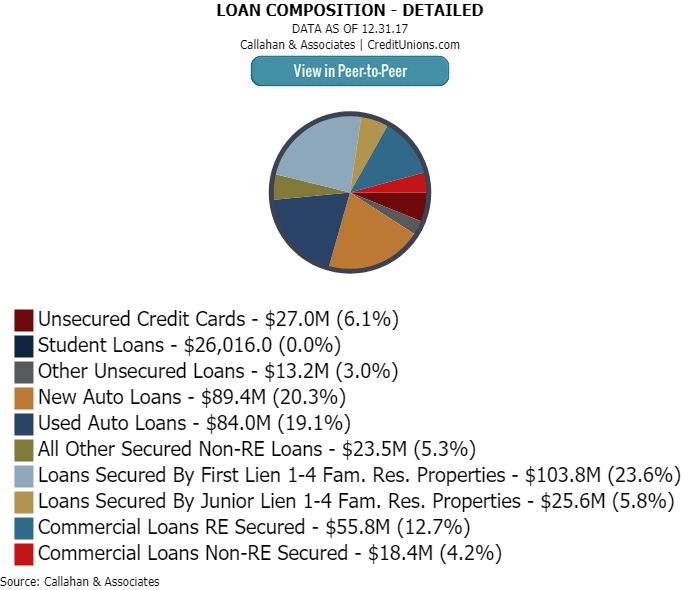 Commercial loans at 121 Financial comprise 16.9% of its total loan portfolio, some $75 million. The typical business development referral is someone who needs more than just a loan. And more than building businesses, 121 Financial is helping to build communities — or rebuild them in some cases. For example, the credit union loaned $15,000 to a coffee roaster that started a business in a building that soon housed a police substation and several other enterprises, all together adding vitality to a depressed neighborhood. The credit union has also made loans to a used car/repair lot, a car shredder, mobile asphalt plant, microbrewery, and even a maker of specialized tire rims for competition racing bicycles. These are not big enterprises. Marovich says most of his business members have annual revenue of $1.5 million or less. 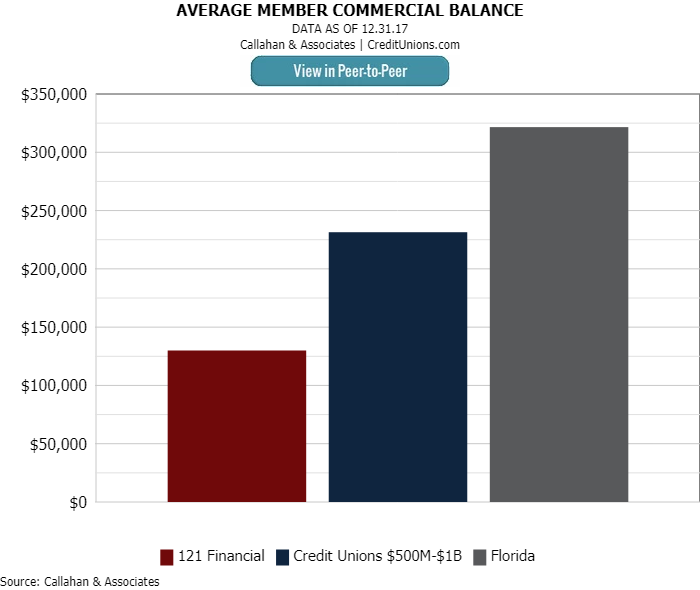 The credit union’s average member commercial balance is $130,000, approximately one-third of the average for all Florida credit unions and slightly more than half of the average for credit unions with $500 million to $1 billion in assets nationwide. We do a lot of mining our own membership. A majority of our business probably comes from these personal referrals. 121 Financial recently converted to the Symitar Episys core and Q2 digital banking platforms. Those new systems will help the credit union expand its business services, beginning with ACH capability for employee direct deposits. Business members already can use remote deposit checking, business checking, and money market accounts as well as the services of a payroll company and merchant services card processor. “We’ve had that for eight or nine years, but we’re going to have more robust functionality soon, including the ability to do anything on a smart phone that you can do online, including wires,” Marovich says. The new features will also include the ability to delegate authority to different employees or an outside accountant. Business members can look for those enhanced features to begin rolling out this summer. “These are things that are important to business owners that we need to do if we want to grow beyond lending money,” Marovich says. Don't reinvent the wheel. Get rolling on important initiatives using documents, policies, and templates borrowed from fellow credit unions. Pull them off the shelf and tailor them to your needs. See what the Policy Exchange from Callahan & Associates has for you. 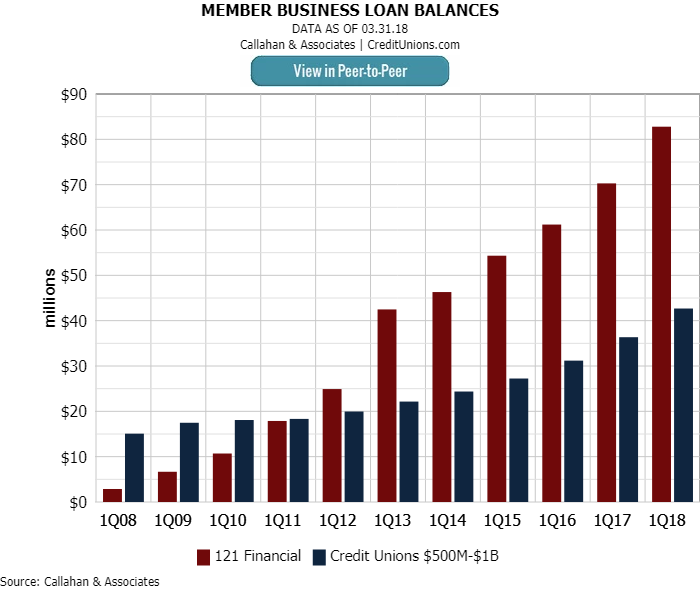 121 Financial held 18.7% of its total loan portfolio in member business loans as of first quarter 2018, according to data from Callahan & Associates. That’s significantly more than its peer average of 8.29% for credit unions of $500 million to $1 billion, although it’s still well below the 27.75% of assets it’s allowed as a designated Low Income Credit Union. “We spend a lot of time in our business loan committee reviewing this before we go to ALCO [asset-liability committee], and we sell some participations to keep us under our cap,” Marovich says. The credit union also addresses risk through its participation in government-backed SBA loans, including 504 program loans that leave only 50% of the note on the credit union’s books. And 121 Financial is an active user of a construction bridge loan program through a state economic development group. “It’s a cool thing we use a lot,” Marovich says of that program, which partners with the SBA 504 offering to eliminate the credit union from having to keep up to 90% of the loan on its books before the SBA loan kicks in after the construction is complete. And that’s just another way the Jacksonville-based credit union continues to expand its own center of influence. What a great strategy. Mining accounts right under your nose. Can't wait to try it out! Thanks for your kind comments! Don't hesitate to let us know how it works out. We're always on the lookout for great stories with actionable insights like this to share with other credit unions.